Should You Go to Church Today? 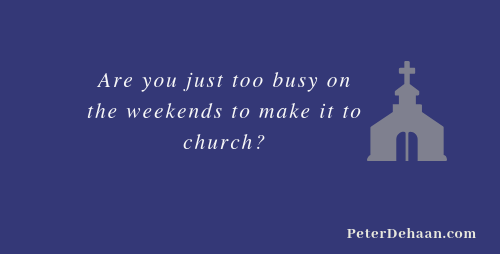 HomeBlogNewsletter ColumnsShould You Go to Church Today? Despite the rain on Halloween we had a steady flow of trick-or-treaters. The next day, Sunday, the rain stopped and the sun shone in the cloudless sky. Unseasonably warm, it promised to be a nice day. With a few extra minutes before church, I when to retrieve the weekly paper in our paper box. A neighbor girl was out riding her bike. She’s about four and likes to ride. She’s also a talkative tyke and not at all shy around adults. “We haven’t gone to church in a long time.” She says this matter-of-factly without any prompting on my part. Although we’ve talked many times, we don’t often have a dialogue. “Maybe you can go next week.” I try to sound hopeful. “We’re just too busy on the weekends.” These are not the words of a four-year old. She’s surely repeating one of her parent’s explanations, complete with voice inflections on the right words for emphasis. I nod. Should I try to say my line one more time? I inhale but don’t get any further. “Wow!” I try to be animated. “Was it fun?” Our conversation goes downhill from there. She continues jabbering as I retrieve the paper. “Have a great day,” I say with a wave and a smile as I head back to the house. “Okay.” With a big grin, she turns and rides away. I understand busy weekends. I can appreciate the pressure of continuous action and ongoing opportunities that our society throws at us with relentless persistence. And I can comprehend that many church services pale when compared to the allure of parties or dim next to the demand of house and yardwork. Sometimes a couple extra hours of sleep seems like the best choice for a Sunday morning. I also know it won’t be long before she doesn’t want to go to church anymore or concludes it’s not important. She’s at a prime age to learn about God and be enthralled by stories from the Bible. Soon she won’t care. Before her parents know what happens there will be boys and boyfriends, a part time job, and the mobility of a driver’s license. She’ll forget about God and stop thinking about church. Her parents will shake their heads over her lack of faith and wonder what went wrong. Maybe I just have an overactive imagination. In this case, I hope so. Maybe she will grow up to believe in God anyway. I pray that she will.